When people found out we were going for a road trip in Iceland, we got several types of responses. "Iceland?? But why Iceland of all places??" "Road trip in Iceland?? What the what! When did this happen??" "You're taking Xena to Iceland??" "She's five. You can't take a five-year-old to Iceland." Okay, so seriously, there were several reasons that led to it. One, it was time for a road trip. Our last one was in Amsterdam, Paris and some other parts of France, but that was two years ago and we needed our booster shot. Viv needed his driving fix, and Xena and I needed our being-driven-around fix. Second, we read that 2016 was the peak of the Northern Lights and that they would dim for a decade. We thought it would be nice if we could plan a trip around them, so we were considering places like Norway, Finland, Iceland, etc. when we found out that a couple of our good friends had done a road trip in Iceland last winter and had loved it. Iceland also seemed like a good choice because in the very likely event that we didn't see the Northern Lights, there was still plenty to do. Third, Viv was already going to be in Amsterdam for his annual work trip and Reykjavik, the capital of Iceland was just a few hours away. Of course, Iceland had never been in my wishlist so I didn't know much about the place. It might have briefly flitted over our collective travel bucket list at some point, but not enough to leave a big impression. And thus started the insane amounts of googling about this island-country situated in the North Atlantic Ocean, between Greenland and Norway. Apparently, it is the most sparsely populated country in Europe, with about 300,000 people occupying an area of 100,000 square kms. Let's compare that to the Singapore population of more than 5 million occupying about 700 square kms. Hmmm. Here's the funny thing -- as revealed in a recent news report, Iceland is top of the list when it comes to health and living standards (based on health goals set by the United Nations). And, Singapore is high up there too, so yay! All right, so Viv left for his Amsterdam trip two weeks before our trip, while I tried to juggle my job (which involves crazy deadlines at the worst times), taking care of Xena, houseguests from India and a bucketload of pending research to do before finalising our day-by-day itinerary. Though Viv and I had sat down and decided on the key places we would be going to, so we could book our accommodation, we had not done anything on the details of what we would see or do at each place. I must have been out of my mind when I told him, "Don't worry. Go ahead, I'll do up the detailed itinerary before I leave." Well, to give myself some credit, I did do more than half of it, but couldn't finish it because, hell, it was already time for my flight! Just like two years ago, we booked the midnight SQ flight to Amsterdam so Xena could sleep through the flight. 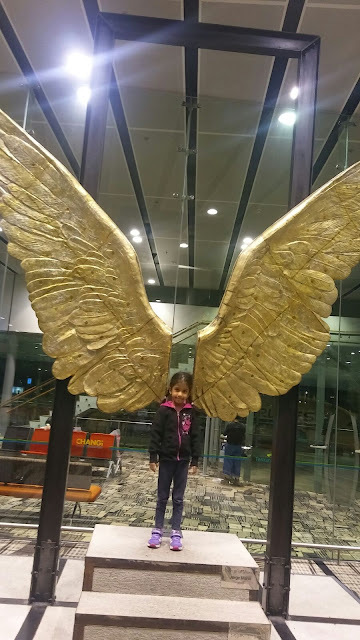 Xena saw this sculpture at Changi airport and wanted to pose 'like an angel'. 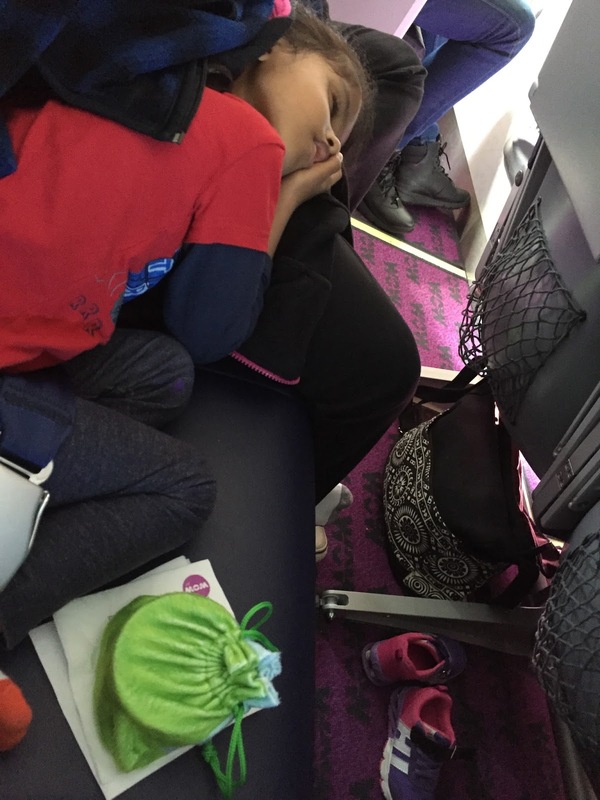 Anything, child, as long as you choose to be angelic on the flight and quickly go to sleep. Now, some of you might know that we don't allow any TV time for Xena, and the only exception is when she's on a flight. So my worry was that she would want to watch TV at midnight and refuse to sleep. But to my utter surprise, when I said the words, "So you eat and go to sleep because it's nighttime, and when you wake up, you can watch TV, okay?" she nodded and said "Okay." Whoa. So she went to sleep, leaving me in peace to watch horrible Hindi movies which I would otherwise never watch. I started watching Dilwale and after about ten minutes, I just couldn't take it anymore. I couldn't believe what had just happened - *I* couldn't take an SRK movie. Oh boy, age sure was catching up. Then I tried a few more and they were just as bad, if not worse. So after unsuccessful attempts at sleeping, I watched some many episodes of The Big Bang theory. 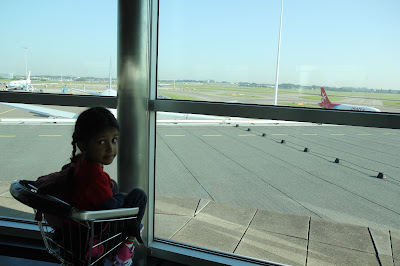 We landed at Amsterdam airport at 7 am. Viv was a little late so I used the airport WiFi to reply to some work emails. Oh no, I was turning into one of those people! But I had no choice as I was in the middle of the 100th issue of the magazine I work on, and things were rather crazy at the office. Viv joined us after a while and we went to Per Tutti! at Schipol Plaza (which was at the airport itself) for lunch. The pizza was really good and so was the tiramisu. Xena insisted on tasting the tiramisu even though Viv told her it had 'beer' in it! And she liked it. Holy cow. So Viv and I polished it off before she could get too many bites. We had a few hours' stopover at Amsterdam and Xena spent some time looking at the planes take off and land. 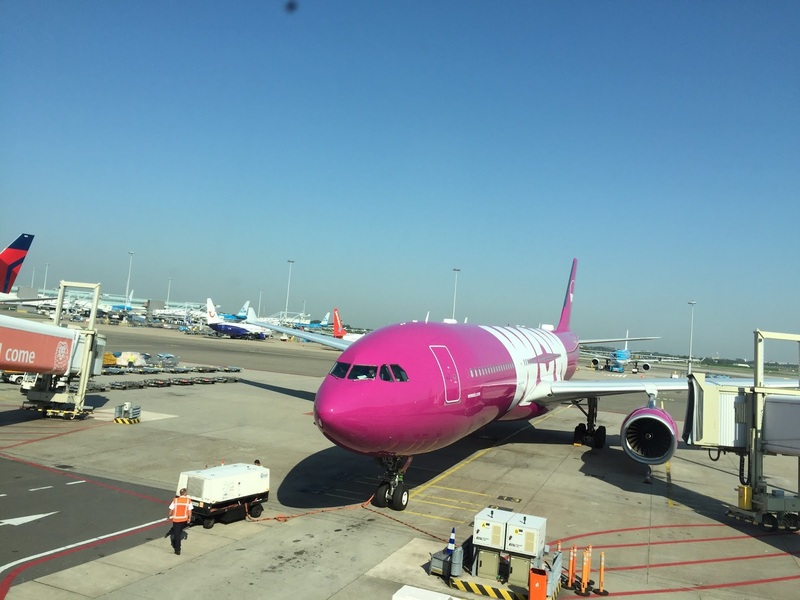 And this was the Wow Air plane we were taking. Oh. So. Pink. We took the 12.40 pm flight to Keflavik airport in Reykjavik. Wow Air is an Icelandic carrier, which is relatively new (their inaugural flight was in 2012), but has rapidly expanded over the last four years. Oh, by the way, the Icelandic flight attendants were really stunning. ...and woke up, fresh as a daisy. We landed at Keflavik airport in about three hours. Viv got himself a local Nova simcard. Our car rental guy from Icerentalcars picked us up from the airport. We were bundled into a van with several other people. It was only when we got out of the van in front of the rental company's office did the full force of the cold weather hit us. Not only was it bitterly cold, it was very windy. As all our real winterwear was still in our luggage, we were definitely underdressed as we waited for our turn to get our car. The car rental guy asked us to get inside his office, and we were very thankful because Xena was going absolutely ballistic, saying things like "It's too cold. It's too too cold. I wanna go to Bintan because it's too cold." 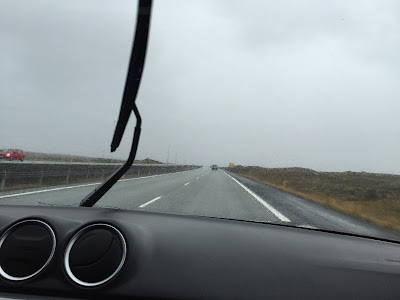 We had booked a 4X4 car as recommended by all the travel websites and blogs we had read. 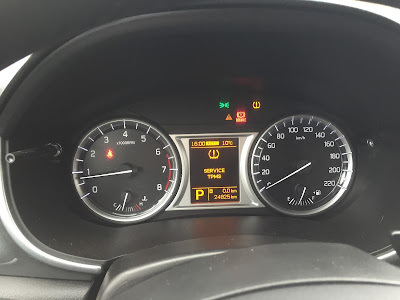 I had no idea what a 4X4 was actually, till Viv explained to me that these cars (also known as 4-wheel-drive, or 4WD) are capable of providing power to all wheel ends. Finally, we got the car and drove off. Xena promptly nicknamed the car 'Cary' (pronounced 'car-ee'). Uh oh. What was that? Was that rain? Uh oh. The rental guys had warned us to be careful when opening the car doors because apparently it could get so windy, the door could just fly off when you opened it! I was laughing at the visual, but as we drove, I realised the gravity of his words, as I could literally feel the wind shaking the car! The guy had also asked us not to try and cross rivers by driving as in the last week, six of his cars had got stuck in various rivers. Though I appreciated his honesty, I did wonder why he needed to share that piece of information with new customers. But then, like Viv said, these incidents were not a reflection of his cars, but more of his customers. 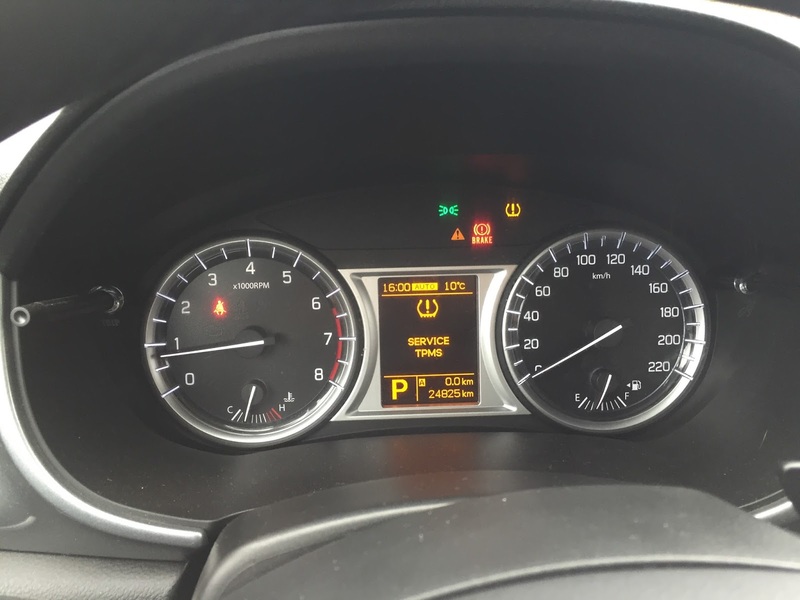 It was still drizzling, and I was getting a little worried because the forecast showed rain all week, which meant that driving would be slightly more dangerous, and the likelihood of spotting the Northern Lights would also be less due to the cloud cover. I had read that the weather in Iceland could be extremely unpredictable and I was prepared for the cold and the wind, but I was really keeping my fingers crossed that rain would stay away. There were waterfalls to be hiked to, and craters to be hiked around, and rain would literally be the wet blanket. By about 8 pm I couldn't keep myself awake any longer. As soon as I hit the bed, I was out like a light, woken up only at 3 am by a wide awake Xena who was done sleeping! She had had a full night's sleep in the plane, so she was understandably jet-lagged. Viv and I somehow managed to keep her lying in bed for the next couple of hours. 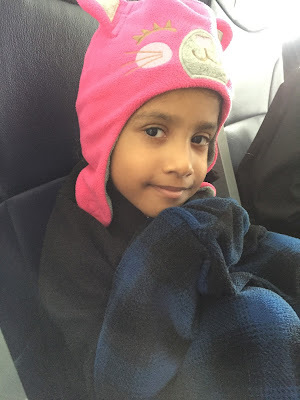 After all, she needed to be well-rested for the amazingly packed day our itinerary had! Lovely entry and loved reading about the road trip. We are also planning a road trip to Iceland in June and would like to know, if you can share the places you stayed at on this trip to Iceland? Just the name or the place/location? Thank you so much for the post and the reply! We did end up going and had a wonderful time. Your travelogue did help a lot!